Submission for Paint Jam 2018 - the theme was Wilderness Trail (painting by Bob Ross). All graphics made using Paint 3D (transparency added in Photoshop). Music and sounds from freesound.org and musescore.org. Programming by me. 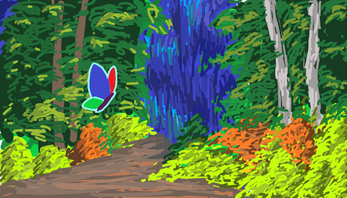 Fly through Wilderness Trail as you collect flowers, avoid bees, and enjoy nature. Each flower earns one point, but bees will take away 1 point each!